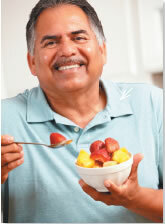 A healthy diet that includes plenty of fresh fruit and vegetables can help to lower and control high blood pressure. Try losing weight, changing your diet, and exercising. Sometimes getting your blood pressure under control requires that you take several medications each day, such as a diuretic and a calcium-channel blocker. But some therapies don't involve medication. "People who have drug intolerances or are unwilling to take medications can try pill-free therapy, and it can also be used to make a medication regimen more effective," says Dr. Randall Zusman, a cardiologist and Harvard Medical School associate professor.